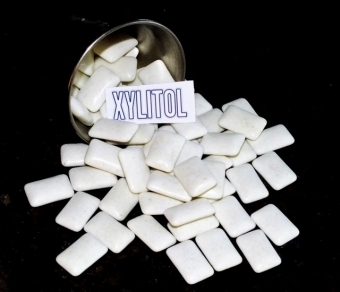 Xylitol is a sweetening agent that is processed from xylan, extracted from birch trees. Low concentrations of xylitol are found naturally occurring in many fibrous fruits and vegetables. Sugar (sucrose) is present in many foods and beverages as an added ingredient which can cause tooth decay. The bacteria in dental plaque easily convert sugar into acids that could harm the teeth. The difference with xylitol is that it cannot be converted by bacteria in the mouth, so it does not cause any acid production. This is why xylitol is used to sweeten some chewing gums, sugar free candies, toothpastes, other products and is available in bulk form too. Please note: Xylitol is not safe for consumption by pets. The oral health benefits of xylitol as a sweetening agent are clear. Your Lorne Park Dental team will be sure to recommend any xylitol containing products that they think may be right for you!